Drama aside, this certainly is the purchase I am happiest about making in recent history. I was extremely happy about the release overlapping with my trip to Japan, as that would save me the effort of paying for the shipping across the Pacific, so I quickly took advantage and picked it up on release day (even though I sort of had the opportunity to get it earlier, but that’s a different story). 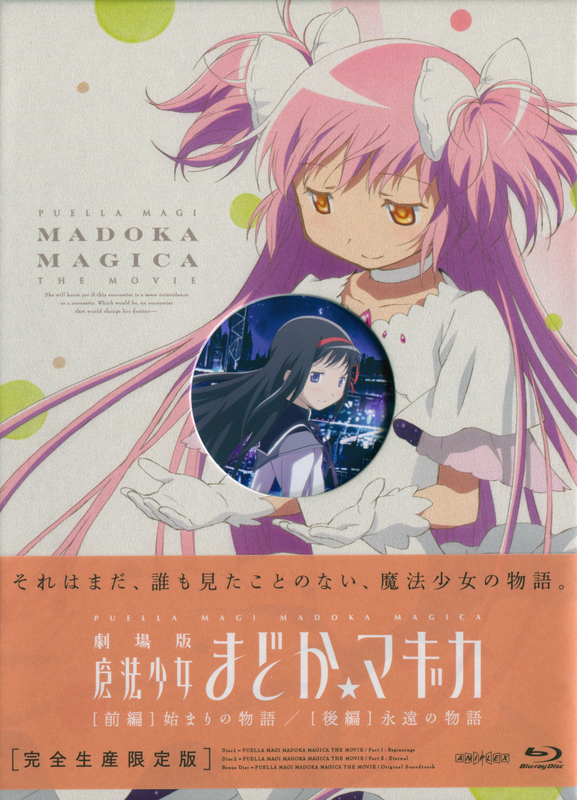 So, this is a review of the Mahou Shoujo Madoka Magica The Movie: Beginnings and Eternal Limited Edition BD+CD set. 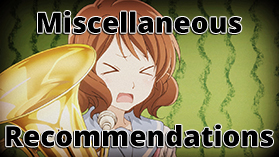 Rather than a review of the anime itself, I will mainly be discussing the physical product. 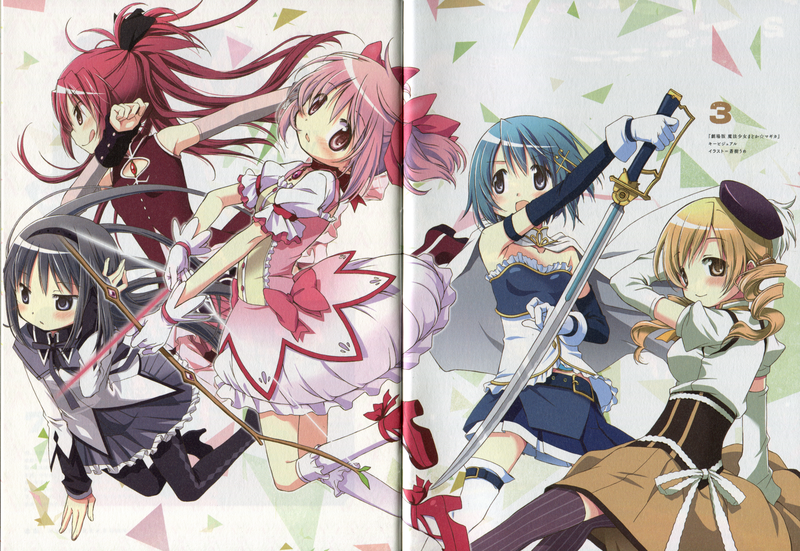 The Madoka Magica movies are not new content, but rather the TV series compressed and altered. The first movie, Beginnings / Hajimari no Monogatari, covers about the first 8 episodes, whereas the second movie, Eternal / Eien no Monogatari, covers the final 4 episodes – that may sound a bit unbalanced, so I’ll expand on that a little later. The first movie is about 130 minutes, and the second is about 110 – collectively, about 4 hours. When I bought it, it was for about 9500 yen (~95USD). The contents of the limited edition set are two Blu-ray discs (one of the movies on each), the soundtrack CD, a “material book,” and, depending on where and when it was purchased, an external bonus of some kind. The movies have subtitles in Japanese, English, French, Spanish, Korean, and Chinese, so the majority of the planet would likely be able to take advantage without needing to wait for a dub or localized release or using fansubs. 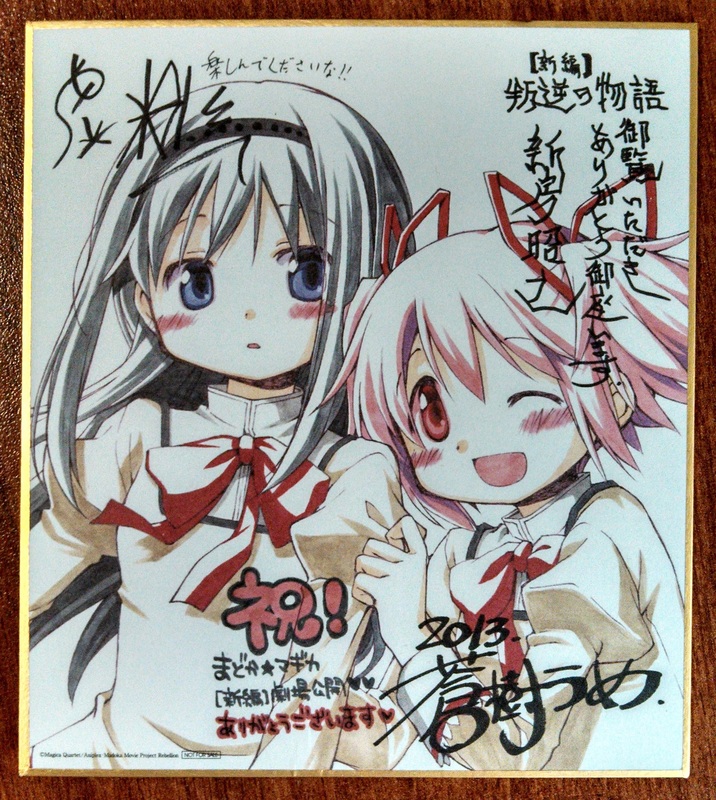 The discs are nice and pretty, especially the CD, of which the design is based on Homura’s shield. In addition to the movies themselves, the discs also have audio commentary, textless ending for the first movie, textless opening (the one halfway through the second is not included – it was the opening song for the TV series), trailers, and TV commercials. There is no textless ending for the second movie because it played during a typical rolling credits screen. The movie audio is also available in both stereo and a 5.1 mix for surround sound systems – this is well worth taking advantage of. Also, since this was the Japanese release of the movie, the audio commentary is not subtitled. 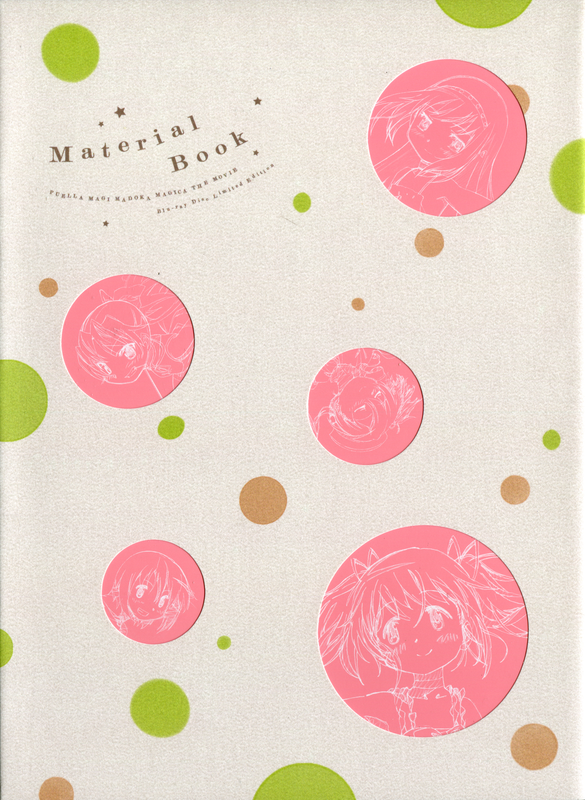 The material book is the main addition to the limited edition set, and has about 55 pages of great bonuses. 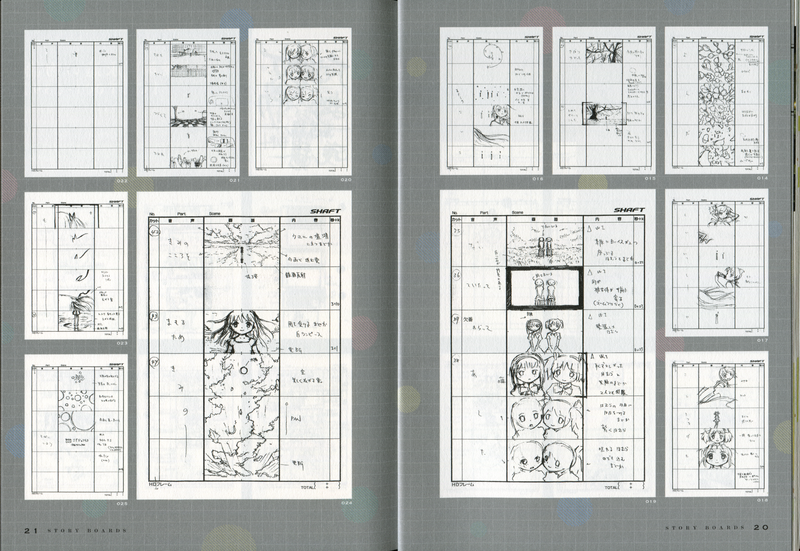 These include a brief overview of the story, an interview with Shinbo Akiyuki – the director – and others at Shaft responsible for making the movies, a message from Urobuchi Gen – the head writer, the “Art Board” – which showcases art from the movies, several pages of storyboards and key animation, a few pages of illustrations for the movies, and various info on the soundtrack, production, and other details. 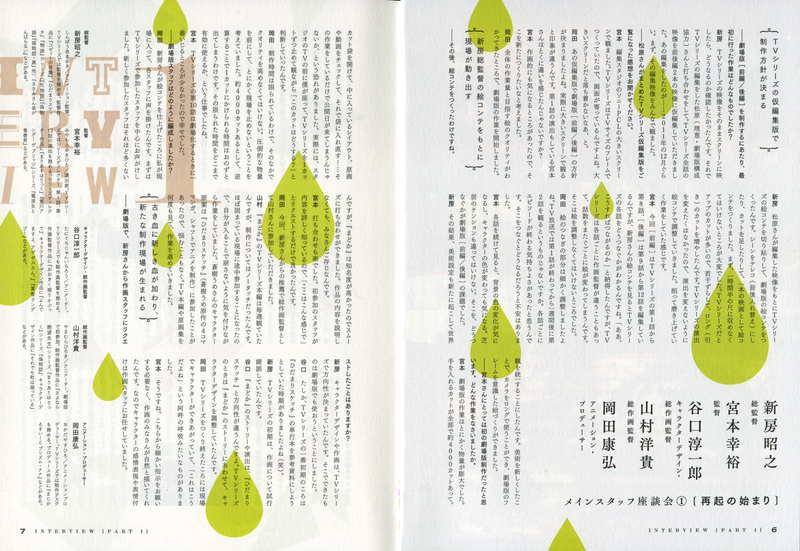 Unfortunately, most of the text is (obviously) in Japanese, so I can only pick out bits and pieces. 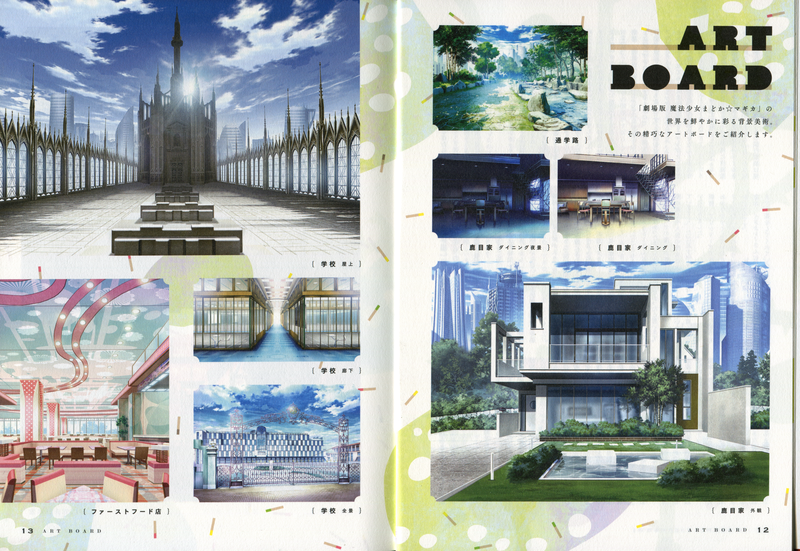 Regardless, there are plenty of pretty pictures within. I was very surprised when the staff handed me this, as I had completely forgotten this was a bonus given out at some stores (mine was the Animate exclusive). So that was nice. I’m not going to do a full review of the movies, because the series has already been reviewed to death – I’ll just offer some relevant advice. If you’re watching the series for the first time (which I would recommend*), watch the TV series first, preferably via the Blu-ray release for max quality – Shaft is a bit infamous for fixing things up extensively for BD releases. *Many people, particularly those who label the series as a deconstruction of the magical girl genre, will say that you need to be familiar with other magical girl anime in order to truly appreciate the series – quite frankly, that isn’t necessary. I went into the series having only seen miscellaneous episodes of Sailor Moon as a kid, yet came out of it loving the show for what it was. So I would recommend watching it regardless. If you’ve already seen the series and enjoyed it, watch the movies – the story is the same, but it looks better, sounds better, and the second movie is nearly perfect. The first had many important details cut out to limit the airing time (Madoka’s dream in the opening, Mami’s wish, various happenings in-between plot points, etc), but if you’re not watching for the first time it won’t be a significant issue. The second movie takes advantage of a longer time span than the original series allowed, ultimately improving the experience drastically. I’ve actually mentioned the soundtrack already in my Top 5 Albums of 2013, so I’ll just summarize what I said there. The soundtrack adds an hour of new music to the original soundtrack – as a standalone listen, it isn’t as good as the TV series’ album, but as new music for the movies, it is fantastic. One song in particular, used at the end of the first movie, helps to massively improve the impact of the situation. Along with adding more fitting music for many points in the movies, it also brings in a lot more variety – whereas many of the original tracks would be used across several episodes of the series, there are fewer repeats in the movies. 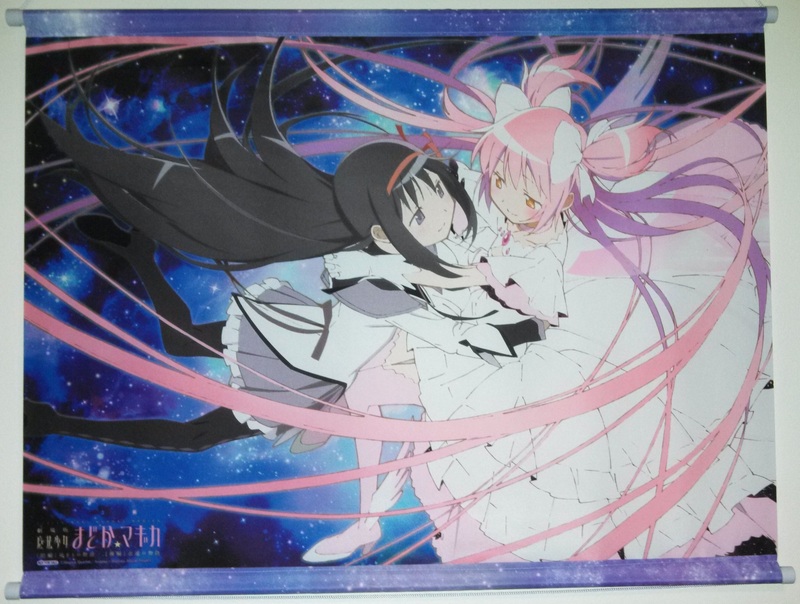 Overall, the limited edition set of the first two Madoka Magica movies with the included bonuses – the “material book,” soundtrack, and wall scroll – was well worth the price for an enjoyable experience that improved upon the series and left me craving the (at-that-point-upcoming) third movie even more. If I lost this set or it was ruined for some demonic reason, I would definitely replace it as long as I could get a new copy for about the original price. I’ve already pre-ordered the limited edition of the third movie, so I am beyond excited to get that and its soundtrack in early April – you can expect a similar review of that around that time. I will also likely do a similar review of my Bakemonogatari set before too long. As a random note – I’m really lazy, so all pictures besides the wall scroll and autograph board were acquired online from people who scanned their own – unfortunately, I didn’t find out where they originated. 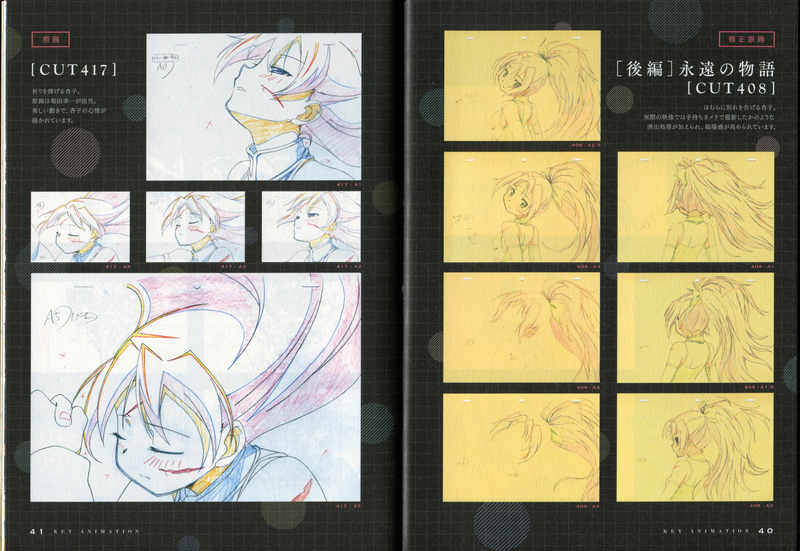 Not to mention that their scans are much higher quality than whatever I’d be able to manage.